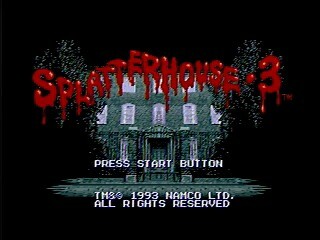 Splatterhouse 3 was originally released by Namco for the Sega Genesis/Mega Drive in March 1993. It was one of the first games to be given a rating by Sega's Videogame Rating Council, receiving an MA-13 rating for its graphic violence and gore. You once again take control of Rick, but the format of the first two games has been dropped in favor of a non-linear beat-em-up format. More attacks were added to Rick's repertoire, but, unfortunately, the slide kick from the first two games is gone and has been given to a couple of the enemies instead. Each stage of the game takes place on a floor of Rick's mansion (with the exception of the last two stages), and you can go from room to room, even backtracking if you need to. A time limit was added to determine the fate of Rick's family, so navigating the rooms quickly is tantamount to their survival. Best time on Game Master difficulty: 0:22:00 by 'Slaughterhouserock' on 2015-03-29. Most of this is copy/paste from my previous run since I'm lazy and didn't want to type it all up again. Most of the time saved is from better execution and a few new strats. I came up with new strats for the bosses of Stage 3 and 6 that save a total of 5-6 seconds between them. Other time saves are too minor to note, but add up over the course of the run. A huge part of the run is manipulating enemy spawns and it can really screw things up if not done properly. This can be done by looking in certain directions, being in a specific spot, or just being on one side of the screen or the other. It differs by room and enemy, but if I'm just standing around or turn around at random, it's for this purpose. Punching an enemy can cause it to "shift" its attack pattern (say, from offense to defense), so that's used a few times throughout the run. Entering doors while in the mutant state will skip the transformation, so this is done whenever possible. If I punch at a random time, it's because I was attempting either a spinkick or the power move (hereafter referred to as breadsticks) and the input wasn't recognized. Breadsticks is to Splatterhouse 3 as the Knee is to Double Dragon 2, so it gets spammed a lot. For anyone interested, I've added all the attack information at the end of the comments. As far as routing is concerned, each stage has several paths. The direct route is used in Stages 1 and 5, while a warp is used in Stages 3 and 4. The warp in Stage 3 cuts out fighting one extra enemy, saving a few seconds, but the warp in 4 can save upwards of 20 seconds by skipping the most RNG-heavy room in the game. There are also "X" stages that occur should you beat a stage with over 2 minutes remaining on the in-game timer. There are variants of these stages, but the only one used in the run is 1X, which you get by beating Stage 1 with over 3 minutes on the clock. Only bosses can block. Foul Beasts are just palette swaps of the first boss, so they keep the ability to block as well, unfortunately. Bag Heads don't block, but can go "through" attacks. They can still be grabbed, though, which makes this optimal barring amazing luck. Red versions of enemies are generally much faster and like to go in for the kill. Top Heavys will come toward you if you attack. Otherwise, they're usually extremely slow and just stand around. The Birdo's tongue attack is an auto knock down, as is their slide attack (telegraphed by biting quickly beforehand), making them very annoying. The Red Mimis also get a slide attack, telegraphed by standing still. Bellyaches and Bag Heads can two shot you. All other damage is negligible. The Megaton Driver is around half a second slower than the Ab Jab, so it's always avoided. The only exception is on the final boss where it's used to avoid a lengthier animation from the boss. Weapons all cause an auto knock down, making them too slow to use. Getting knocked down wastes around 2-3 seconds. Getting killed wastes almost 8 seconds. You have some invulnerability frames when doing an attack while grabbing an enemy and when transforming/reverting. The hitbox for breadsticks is...well, weird. Sometimes it will miss something on screen, but hit something off screen and I don't know why. The only idea I've come up with is that if the enemy hasn't moved yet, it doesn't seem to register as actually being hittable. I could be wrong, but that's the only consistent thing I've noticed with it. It's hard to tell when time starts since you move into the first room automatically and, by holding right, just continue to move. You gain control when Rick's face is even with the right side of the first window. For reference, this is frame 2260 in the encodes. You lose control on the final fight at the same time the clouds stop moving. This is frame 81359 in the encodes. I admit up front that this run has its share of problems. Mainly, I had tons of dropped inputs for some reason (I assume this game has just destroyed another controller, but I'm not positive). This cost me roughly 8-10 seconds over the course of the run. The worst offender is the Birdo room in Stage 4 where it cost me 6 seconds. I recommend watching my twitch VOD where you can hear me mashing away while Rick just stands there, getting knocked down. Almost every enemy in the game has an instant KD attack and they use them often. Stage 3 is usually the worst in this regard and has ruined many runs. The Stage 4 fiasco were the only knockdowns in the run. Also, as mentioned above, only bosses can block, but I had no blocks in this run making all the boss fights perfect. Stage 1 has a surprising number of minor things that can easily make you lose time. From enemies not having consistent spawn times to bad AI patterns, it's easy to lose 5-6 seconds throughout the stage. I got lucky with the RNG here, so it was just a matter of not screwing up. The boss fight is particularly hard in that, if it's not timed right, you'll lose anywhere from 3-5 seconds. 1X is all RNG. The dogs can jump which makes them invulnerable (it happens once here) and can do so indefinitely. Leaving them permanently invulnerable until they stop. I found using breadsticks to finish the second Baghead is faster than just another nutpunch by about half a second. Stage 3 is a nightmare of a stage. So many things can go wrong here that will make you lose tons of time (e.g. I've lost 15 seconds in the first room before). The Bellyaches get super speed when backed into a corner. I don't know if that was intentional or a glitch, but it makes grouping them next to the door fairly dangerous. Once dropped input and it's a reset. The poltergeist room is a strat Molotov came up with. I move back when entering the Birdo room to avoid an impending slide kick which happens ~90% of the time. Of course, it didn't here. The Birdos can jump and get the same invulnerability that the dogs do, but luckily that didn't happen. I had some dropped inputs in the Foul Beast room costing about 3 seconds. I grab the heart just so it wouldn't be in the way of getting the orb. The beginning of the long hallway was pretty bad, again with the dropped inputs. The Teddy Bear fight is a new strat I came up with just a few days prior to this. It's faster and cuts the RNG factor of the fight in half. 3X - move forward, use breadsticks. I skip picking up a second orb to save some frames. If I had some dropped inputs here, that would've cost me up to 6 seconds. Stage 4 is all spawn manipulation and dealing with Dog/Birdo RNG. I got really lucky in the first room with the Mimi actually moving towards me and the Birdo sliding. I move back in the first Dog room to get the last one to spawn on the left. I have to face left in the Top Heavy room to get the Zombies to spawn on the right. And I stay on the left so the last Top Heavy will spawn on the right. The Birdo room had tons of lost inputs (you can hear me mashing in my twitch VOD), costing me 6 seconds. I throw a Dog to the left in the last Dog room to make the last one spawn on the right. The boss fight was perfect. He averages 2 blocks. 4X - see 3X, but with Dogs and their jump mechanic. Lost ~1.5 seconds here. Stage 5 is more spawn manipulation and Birdo RNG. I stay on the left in the long hallway to manipulate the Top Heavys to spawn on the right since I can't move left in that room. Otherwise one would spawn off-screen on the left and screw everything up. The Bagheads gave me a horrible pattern costing me a few seconds. The Foul Beast room can make or break a run based solely on the RNG the first one gives me. Luckily it worked out. The boss is pretty simple, and I got the best pattern. Stage 6 is just the final boss. I came up with a new strat that incorporates the Megaton Driver which isn't seen anywhere else in the run because it's so slow to perform. I use it here to move the boss away from the edge of the screen, keeping it from performing a phase move that is pretty slow. Overall, it saves ~2.5 seconds. This run is a 19 second improvement over my last submission and a 4 second improvement over my previous PB. My only regret is that there were so many dropped inputs, resulting in some embarrassing moments. Otherwise, I'm pretty happy to put this game aside...for now. Power Move        	248	Back, Forward, Back, Attack; 120 versus "Big Enemies/Bosses"